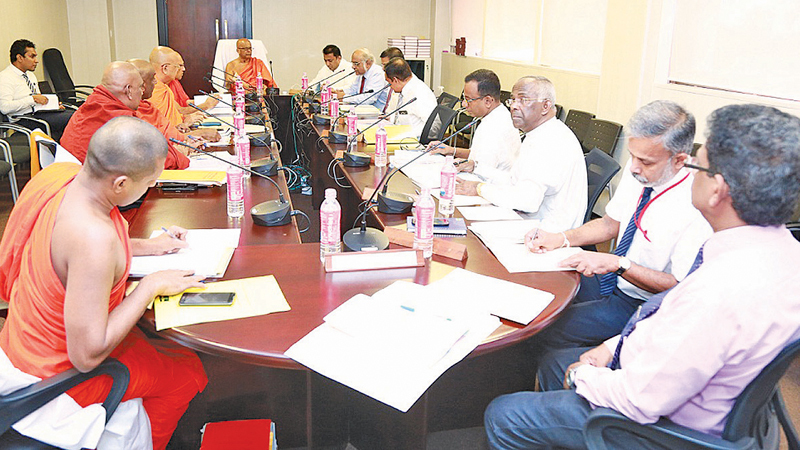 Education Minister Akila Viraj Kariyawasam at the Piriven Education Committee meeting with member monks. The Education Ministry has taken measures to improve the tri-lingual ability of Samanera Bhikkus studying at Pirivenas. English and Tamil teacher vacancies will be filled in Pirivenas under this move. The Chief Incumbents of the Three Chapters had requested the Education Ministry to take prompt action to fill vacancies of Tamil teachers at Pirivenas.The Education Ministry has instructed officials of the Pirivena Education Division to end the Tamil teacher shortage by recruiting qualified persons to the Teacher's Service. “The proposal submitted by the Piriven Education Division to recruit Tamil teachers, received the approval of the Piriven Education Committee at its 181st committee meeting held yesterday,” Education Minister Akila Viraj Kariyawasam said. Language ability is essential for a religious leader. Besides, the Tamil knowledge of Bhikkus can be well utilised for strengthening ethnic harmony,” the Minister added. Fifty Tamil teachers will be recruited under the first phase. After considering the requirement, measures will be taken to recruit another team of Tamil teachers in future, he said.